We’d love your help. Let us know what’s wrong with this preview of Miracle at the Higher Grounds Cafe by Max Lucado. Chelsea Chambers is on her own. After a public split from her NFL superstar husband, Chelsea takes a bold step out of the limelight and behind the counter of the Higher Grounds Cafe, an old-fashioned coffee shop in dire need of reinvention. But when her courage, expert planning, and out-of-this What if you could ask God anything? What would you ask? And how would He answer? To ask other readers questions about Miracle at the Higher Grounds Cafe, please sign up. MIRACLE AT THE HIGHER GROUNDS CAFE is all about love, forgiveness, and of course, coffee. I was instantly caught up in Chelsea's life and her problems. My heart broke for her and all she was going through. Keep a box of tissues close by while reading all about Chelsea and her customers and of course, Manny! Grab a big cup of coffee, your favorite blanket, this wonderful story and be prepared to finish in one or two sittings. Max Lucado does not preach his story, but rather shows you the beauty o MIRACLE AT THE HIGHER GROUNDS CAFE is all about love, forgiveness, and of course, coffee. I was instantly caught up in Chelsea's life and her problems. My heart broke for her and all she was going through. Keep a box of tissues close by while reading all about Chelsea and her customers and of course, Manny! Grab a big cup of coffee, your favorite blanket, this wonderful story and be prepared to finish in one or two sittings. Max Lucado does not preach his story, but rather shows you the beauty of faith and forgiveness. We can all use a little help in our daily lives. We just have to learn how to ask for it. Chelsea Chambers has many hassles. She's inherited her mother's cafe, which had been a family business for generations, but discovered an $86 000 debt. This comes on the heels of separating from her husband, who has cheated on her, and trying to deal with the confusion and grief of their two young children. But business takes a sudden boom with the arrival of the 'God Blog' on her premises; a direct internet line to God, who offers to answer the heartfelt prayers of any customers. Chelsea's staf Chelsea Chambers has many hassles. She's inherited her mother's cafe, which had been a family business for generations, but discovered an $86 000 debt. This comes on the heels of separating from her husband, who has cheated on her, and trying to deal with the confusion and grief of their two young children. But business takes a sudden boom with the arrival of the 'God Blog' on her premises; a direct internet line to God, who offers to answer the heartfelt prayers of any customers. Chelsea's staff are more than meet the eye too. This book was about faith, forgiveness and the healing power of God's love. If you like reading books by Max Lucado, then you will like this one too. A different sort of Max Lucado book...but an entertaining one! In general feel this is almost like a cozy cafe mystery. There's a problem to solve, people who rally around and support the key character(s) and a heart-warming solution at the end. It's not a mystery though. It's also not a romance, though it certainly demonstrates elements of relationships, seeing the truth in others, and the importance of forgiveness. This is a book about community, about trust and, most of all, about prayer. It's for anyone who's ever wondered, "Is God listening? Does He real In general feel this is almost like a cozy cafe mystery. There's a problem to solve, people who rally around and support the key character(s) and a heart-warming solution at the end. This is a book about community, about trust and, most of all, about prayer. It's for anyone who's ever wondered, "Is God listening? Does He really care? What difference does it make if I pray?" It's a book about love: love of a parent, love of a spouse, love of a friend, love of a sibling, and God's love for us. This is an other great teaching by the great author Max Lucado.. Please read weather you are a Christian or not. It has many jems. MIRACLE AT THE HIGHER GROUNDS CAFE is a cute story. At first I was disenchanted as Mr. Lucado started the book with major backstory. But once the information dump was over, the story picked up and grabbed my interest. My son asked me if this was nonfiction, since that is what Mr. Lucado is known for, and I told him no, this is fiction, but it is showing us the very real-spiritual battle that goes on daily in the world that we can't see or comprehend. I absolutely loved the way Mr. Lucado portray MIRACLE AT THE HIGHER GROUNDS CAFE is a cute story. At first I was disenchanted as Mr. Lucado started the book with major backstory. But once the information dump was over, the story picked up and grabbed my interest. My son asked me if this was nonfiction, since that is what Mr. Lucado is known for, and I told him no, this is fiction, but it is showing us the very real-spiritual battle that goes on daily in the world that we can't see or comprehend. I absolutely loved the way Mr. Lucado portrayed this, and even more, I liked the spiritual truths that he shared in the book. I won this book through Goodreads First-reads. Chelsea was facing many of life's problems, when she open a coffee shop café. A stranger came to the shop and was a big help in running the store. Soon customers came too. they also wanted answers. The answers came on the internet in her store. They were all talking to someone Divine. Finally Chelsea got the answers she needed in a most unexpected way. It was a hard to put down book. Chelsea Chambers, recently separated from her NFL husband, finds herself the owner of the Higher Ground Cafe. The Cafe is in need of renovation, and Chelsea is having trouble competing with the contemporary coffee shops with the latest technology. But with the help of her quirky guardian angel, Manny, and her neighbor Bo, Chelsea finds the faith to persevere. Her two children miss their Dad, and Chelsea struggles with being a single Mom. But, with some heavenly intervention, miracles can happen. Chelsea Chambers, recently separated from her NFL husband, finds herself the owner of the Higher Ground Cafe. The Cafe is in need of renovation, and Chelsea is having trouble competing with the contemporary coffee shops with the latest technology. But with the help of her quirky guardian angel, Manny, and her neighbor Bo, Chelsea finds the faith to persevere. Her two children miss their Dad, and Chelsea struggles with being a single Mom. But, with some heavenly intervention, miracles can happen. A sweet inspirational story that reminds us that God does answer our prayers. This was a cute story, and I loved the cafe setting. BUT the story was a bit too fantastic, and the characters didn't seem to react appropriately to things that would happen. There were conversations that were hard to follow, and I had to re-read them several times to understand. It just seemed poorly written. Nice ending, and I loved the spiritual truths throughout... I REALLY wanted to enjoy it more! Als een boek je laat zuchten, sniffen, verwonderen en genieten vind ik het helemaal terecht dat ik dit boek 5 sterren geef. Jawel er is heus wat op aan te merken. Maar dat gevoel dat het me gaf verdient dit. Oh my unicorn, ik heb net een goddelijk boek 5 sterren gegeven. From the very first paragraph, I knew I was going to rate this 5 stars. This story is so my style! I absolutely love the writing technique. The beautiful details of everything going on and the description of the cafe. Aww!!! Love it!! A lovely book that will remind you of It's a Wonderful Life. A sweet heavenly read. The author shows the power of prayer and the need of so many. Sometimes our heart and soul just need a refresher course. Miracle At The Higher Grounds Cafe by Max Lucado is a wonderful novel, and I was blessed to receive a copy. I have read many books by Max Lucado, and have never been disappointed, and this latest novel was no exception. Chelsea Chambers inherited the Higher Grounds cafe from her mother, who in turn had inherited it from her mother. For newly separated Chelsea and her two children Hancock and Emily, it is to be a new start in life. Chelsea is married to a former NFL star, who cheated on her. 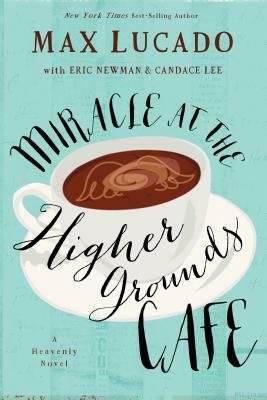 Chels Miracle At The Higher Grounds Cafe by Max Lucado is a wonderful novel, and I was blessed to receive a copy. I have read many books by Max Lucado, and have never been disappointed, and this latest novel was no exception. Chelsea Chambers inherited the Higher Grounds cafe from her mother, who in turn had inherited it from her mother. For newly separated Chelsea and her two children Hancock and Emily, it is to be a new start in life. Chelsea is married to a former NFL star, who cheated on her. Chelsea feels bitter, vulnerable and determined not to be hurt again. She is already the product of divorced parents, and feels great dislike of her father. Chelsea wants the cafe to be a success. It is a slow start, but when new employee Manny starts work, people begin to flood into the cafe as they hear of the miraculous things that are happening. The novel is an easy read, but the content is deep, and can have a profound effect on one's faith. There is the theme running throughout of a God who never leaves us. We may think that we face our toughest times alone, but that is when God is closest. The theme of life being a spiritual battle between the forces of light and darkness is also present. When life seems at its bleakest, that is when it is important to hang on to the light. The theme of forgiveness occurs in the novel. Chelsea realises that there are people she must forgive, but resists for fear of being hurt again. Will she do the right thing and forgive? Or will she hang on to unforgiveness? The bond of love and family is clearly demonstrated in the novel. Family is not just blood related, but community based. The reader is reminded that everyone is part of God's family. I really enjoyed reading Miracle At The Higher Grounds Cafe. Max Lucado presents simple God given truths, that we should all be aware of. When they hit your very soul, you find yourself gasping at the enormity of what Max is saying. You can read Miracle At The Higher Grounds Cafe just on the surface as a 'nice' novel, but I urge you to go deeper and let the words penetrate into your soul. Realise that the God presented in the novel loves you and will never leave you. He longs to hear from you - so send Him your knee mail today. What an interesting story! I have to say I was surprised by how this novel kept me turning the pages quickly with the God Blog and delicious pastry goodies. At first I was really leery of the whole angel thing, but by the end that was one of my favorite parts! Max really makes a point that you really never know when you could be entertaining angels (or they could even be entreating you!). Manny was so priceless as a guardian angel! As a whole, the plot was good. I enjoyed all the characters and fe What an interesting story! I have to say I was surprised by how this novel kept me turning the pages quickly with the God Blog and delicious pastry goodies. As a whole, the plot was good. I enjoyed all the characters and felt majority of them had transforming character development, but did feel the ending was slightly rushed. It was a good wrapping up of loose ends, but just a little too fast for my taste. I would say this was an inspiring quick read, especially concerning prayer. I was greatly moved by the reminder of how God ALWAYS answers/hears our prayers. He just might answer differently then we expect Him too. Overall, I would recommend this read to coffee lovers and anyone who loves a heroine “getting it” by the end. What a charming little book. I fell in love with the characters. I feel as if I really know them. I read slowly because I didn't want to leave their little world. It is definitely in my top 5 favorite books. I just finished this book less than 15 minutes ago and miss all the characters. Makes me want to start all over. This book I will be keeping! After a streak of meh reads, I needed a palate cleanser and this called to me while I was perusing my shelves. I generally do not like Christian fiction because I don't like my faith to be trivialized. However this was a very simple yet touching story. If you could ask God one question what would it be? It reminds me that God is always near. This was a December book club selection. And considering the season, it was nice to read something lighter and somewhat inspirational. As a rule, I am even more critical of Christian fiction than I am of general fiction. I have some strong progressive Christian beliefs, and for better or worse, most Christian fiction tends to lean toward a more conservative fundamentalist view of Christianity. Also, a lot of Christian fiction is rather Pollyannaish. You see a lot of characters who face serious l This was a December book club selection. And considering the season, it was nice to read something lighter and somewhat inspirational. As a rule, I am even more critical of Christian fiction than I am of general fiction. I have some strong progressive Christian beliefs, and for better or worse, most Christian fiction tends to lean toward a more conservative fundamentalist view of Christianity. Also, a lot of Christian fiction is rather Pollyannaish. You see a lot of characters who face serious life challenges, along with deep emotional and spiritual conflicts. And they miraculously overcome every obstacle in a few short chapters--usually with a few prayers and maybe a visit from an angel--to live happily ever after. Don't get me wrong. Miracles do happen. And prayer is powerful. But those happily ever after endings are a bit exaggerated. If you are after a serious fiction read, this is not the book. But if you are willing to use your imagination, and permit yourself to ask what if.. What if you had a guardian angel? What if God used the internet to communicate? What if you had the opportunity to ask God one question and a written response is given? Very interesting and up lifting. A great read to start the new year!! this was not only the worst book I read this year, but possibly the worst book I've ever read. I cannot believe I finished it out of spite. Chelsea is a terrible person, and she owns a cafe where her guardian angel works? she does so many petty and awful things, like purposefully serving someone a coffee loaded with cream and sugar, not knowing if they're diabetic or not... out of jealousy. I wish I could giv this was not only the worst book I read this year, but possibly the worst book I've ever read. I cannot believe I finished it out of spite. I thought that it was just marvelous. This is the first book of his that I have read. I will be reading many of his books. Thank you very much. Really good story, but at first got a little confusing with the shifting of perspectives. Once I was used to it, I really enjoyed it. I generally do not read fiction but Lucado is one of my favorite authors. The book was a bit unrealistic and predictable as most fiction is. Thus why I don't like fiction. But a good read none the less. One I could not put down for the most part.